As boomer women in our autumn years, we share a great bond and affinity. We have come into this great open space in the 21st century and the opportunities for us are only limited by our imagination and energy. There is much to be done and we are perfectly poised and positioned to get it done! Many of us are now grandmothers, if not, then mothers of grown children and we are well on the other side of the tyranny of the family demands that come with raising little ones. We have cultivated our gifts through the years and have given of our time and energy to serve the needs of those we now find can do it without us. An open pathway lies before us to explore a﻿nd discover in life and business as never before. 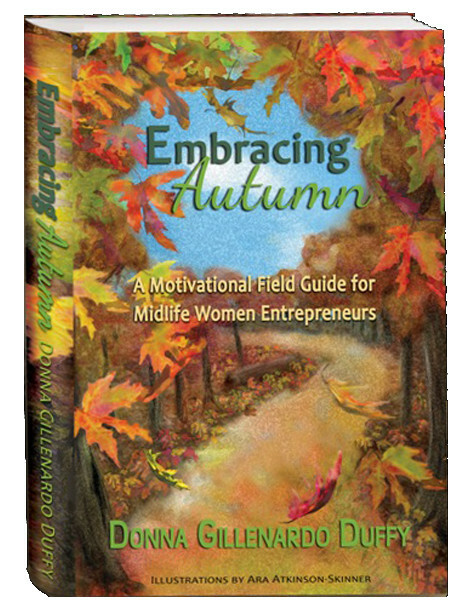 Embracing Autumn is a companion manual for the journey. A reminder and a guide; a manifesto for the way that will constantly and gently beckon us to walk in our calling as we bring our body of work to the world. Join me as we sojourn together as sisters, friends and companions, sharing our triumphs and our challenges, our victories and our defeats, our teaching and our learning. This is an incredible time to bring our message to the world, to let our light shine and live out the purpose for which we were born. We'd love to hear your story and to help you craft your own Embracing Autumn manifesto. Register below to join the sisterhood. We look forward to traveling the road with you! We'd love for you to join our community. Receive your complimentary Embracing Autumn Survival Kit when you sign up! Including one free chapter of Embracing Autumn, Open Every Gift: 30 Days to Discovery and Gratitude, and 21 Ways I Stay in a CEO State of Mind! We look forward to staying connected with you!